This multifunctional pad from Kronoswiss provides advanced sound insulation when walked on, and a built-in micro-pumping system provides air circulation and eliminates water vapor from the floor. This product is really worth the extra expense. This is a very dense fiber pad. It is not foam. It not only will make the floor a lot quieter to walk on, it makes minor dips and mounds in the sub floor much less noticeable. I have installed a lot of laminate with and without Quiet Walk and this stuff is incredible. 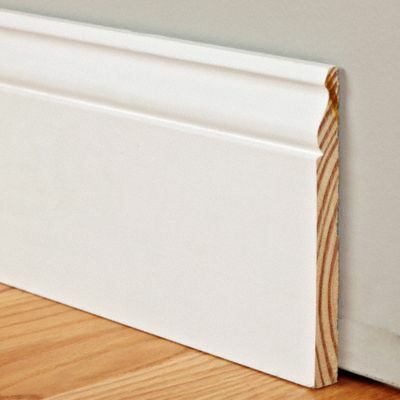 High quality made in USA MDF primed baseboard. No finger joints. Similar products at box stores for $1.68 to $2.05 per ft. Limited quantity, limited time offer. Used to bridge the expansion between laminate floors, from one room to another, or as a transition between laminate flooring or carpet of equal height. Includes Metal track and fasteners. Used to make the transition from the laminate flooring height to a flooring system of lesser height such as vinyl or tile. Includes metal track, and fasteners. Used between the floating floor and the carpet, and is also used for the finishing of the laminate edge on outside doors. Used for installation of stairs. Used to provide expansion area coverage at the perimeter walls in those situations where the existing wall base will remain in place. Commonly called base board, protects lower section of wall from damage.